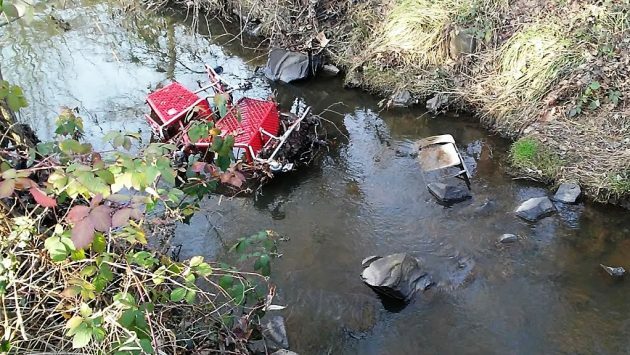 Abandoned shopping carts: Two in Periwinkle Creek, one on the creekside bike path at Queen Avenue on Saturday. 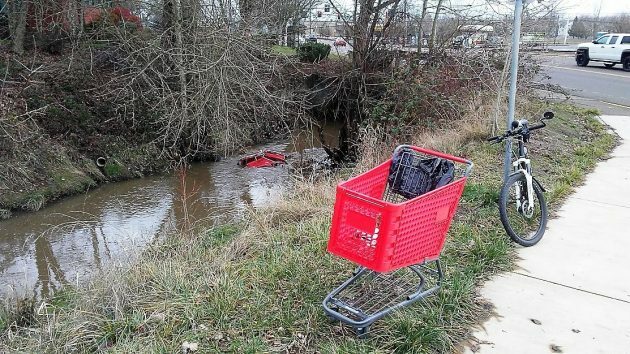 A week ago Saturday two red shopping carts were mired at the bottom of Perwinkle Creek just off Queen Avenue. A week later, yesterday, another one was abandoned on the bike path above. I could see no store name or other indication from where these particular carts had been purloined. The law required businesses to put their names on their carts along with a local telephone number that finders of abandoned carts could call to have them retrieved. Signs on the carts also were to announce that “unauthorized appropriation” of the cart is a crime under state law. Once owners are notified of an abandoned cart, the city ordinance gives them 72 hours to pick it up or face a $50 fine. If they don’t, the city may retrieve the cart, and owners can claim it by paying a $50 fine. If they don’t claim it, the city can get rid of it. On that Wednesday night in May 2008, the city council adopted this ordinance by a vote of 5-1. The lone dissenter was Bessie Johnson, the Ward 3 councilor who has just been re-elected to her fifth four-year term. Carts and other trash at the bottom of Periwinkle Creek on Nov. 12. Somebody willing to steal a cart likely has little concern if the store gets fined $50. Fine them $50 and the problem will be greatly curtailed. Think about it for a second – pass a law that imposes a penalty on the victim. So, how do you justify your ineffective ordinance? Abandoned shopping carts are not a blight, they are a rolling reminder of Albany’s underclass. And APD clearly won’t enforce the existing ordinance, so instead of criminal sanctions, the city should give carts away for free. A plaque should be attached that gives permission to use and discard the cart without fear of consequence, especially in the gentrified downtown area. A cart corral would look nice next to the Carousel. On this issue let your heart bleed, not harden. We should ask her why the police don’t enforce laws related to storage of trailers on public streets. Ask her why the Coppers don’t ticket cars stored on public streets for months. Ask Prescient Bessie why people in her Ward store garbage cans with disease-filled trash spilling out on the streets and the Constabulary does nothing. Since Prescient Bessie’s been on the Seat of Power for 5 or more terms, It seems as though she should have been voting nay on several City Code matters….especially those that require the police to get out of their comfortable cars and actually write a ticket. What Bessie should have said was “not sure why we need another ordinance on the books that may not be enforced”…period. As exemplified in the photos, you have shopping carts WITHOUT store names, which means that the law is NOT being enforced. And there is NO excuse for it, Albany isn’t so big that ONE person can’t spend maybe a day or two going around to all the stores with shopping carts and checking to see who is in compliance and who isn’t. Seems like fining the store is punishing the victim. We don’t fine a car owner if someone steals their car and then abandons it. That said, people who steal shopping carts probably don’t have the money to pay a fine, nor do they care whether it breaks a law. Those carts are pretty expensive but it isn’t practical for stores to search for missing carts. A better solution might be for the city to just confiscate abandoned carts and sell them at their occasional public auctions. Perhaps first of all, might be to schedule a meeting to discuss possible alternatives with store s and interested public. Yee Ha ! Unbranded shopping carts ripe for shopping cart rustling. I could use one for ferrying parts around our farm shop. We would probably fix that cockeyed wheel too. Whenever I read hh-today, I think of another famous newspaperperson: William D. Boyce. Who, not coincidentally, founded the Scouting program in the United States. Seems journalist-entrepeneurs often can’t help but for civic improvement. Errant carts are an example of degradation of ‘The Commons’- places we hold together without specific accountability- finger wagging, “call the cops-they’ll know what to do,” notwithstanding. What does the Scouting program seek? To internalize a sense of duty without expected reward. To do a good turn, daily. How about this? Challenge the Albany BSA Scouting units to corral the carts. Take them back to the store owners, when known. Take them to Burcham’s, when unknown. Let Jay dispose of them, as he sees fit after 30 days- could be Republic Services, too; but I like Burcham’s. He could develop a network of store contacts to announce new arrivals. Scouts keep account of the retrieved cart(s): location, date, any other notable facts to determine if there’s a method to the madness. Make the report, coincidentally, right at the time that Scouts hold their Friends of Scouting pledge drive. To finish- the matter at hand is one that will only be resolved over a generation or two. Folks who leave carts in Periwinkle Creek are not connected to the community at large, and do not have an internalized sense of duty to the common good. 50 bucks, one way or another, isn’t going to change that. A steady commitment to ask our youth to do better, will. One way to solve the problem. We traveled Vancouver Canada a few years back, all the supermarkets we went to, we had to pay 1.00 $$ to get the cart out of the holding area. When done, you return the cart and get your $1.00 back. People we talked to about this, said it works great and do not see hardly and abandoned carts. Many countries in Europe have hit on a great way to deal with shopping carts. In order to get one out of the cart corral, you have to deposit one Euro which is returned to you when you return the cart to the corral. This is the same idea used for luggage carts in airports. From what I observed, it works perfectly !! No need to look at Canada, or Europe, for this solution. ALDI, an American grocer, operates more than 1,600 stores in 35 states. They only charge a quarter, and you get it back when you return the cart to the corral. You’d think ‘progressive’ stores in Albany would adopt this practice. Makes no sense to fine the stores. Big chains don’t care, and small stores aren’t going to have the resources to fish their stolen carts from the river and such to avoid the fines! Deposit idea seems good, but the stores have to implement it (an ordinance to force it would be weird). It could put some of those employees (mostly young folks at the first job) out of a job who’s job is to fetch and organize the carts, but could help the problem of carts abandoned at recycling centers and such. “locking ” system. The carts can only go so far, then the wheels lock…goes to end of parking spaces…albany should think about this, there are not that many “grocery ” stores here ..